Miguel Cristóvão was one of the 2018 GT4 European Series Pro-Am title contenders. 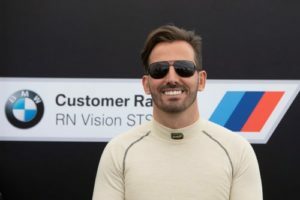 In 2019 he will be one of the names joining the GT4 South European Series, showing the enthusiasm around the recently launched series. The Portuguese driver was one of the protagonists in the last year’s European GT4 season, having consistently put in good performances over the season in the RN Vision STS BMW M4 GT4, which he shared with Pavel Lefterov. The pair won the second race in Misano and climbed the podium several times in the Pro-Am class, finishing a couple of times in the overall top-ten. These results allowed them to arrive with a class title shot for the season showdown at Nurburgring. However, the German round wasn’t easy for the BMW M4 GT4 duo, wrapping the season in the Pro-Am class fourth position. In 2019 Miguel Cristóvão will return to GT4 racing but this time he chose to take part in the GT4 South European Series opening season. “The GT4 European Series experience was fantastic and I showed that I could be competitive in a season in which most of the circuits were new to me. In 2019 I hope to use that experience to achieve good results in the GT4 South European Series. It’s a series that seduced me from the beginning as it has interesting circuits, some of the best in Europe. On top of it, it will have TV broadcast in Spain and Portugal, which, together with interesting budgets comparing to the European’s alternatives, promises a great media exposure”, said the driver from Cascais. Miguel Cristóvão is assured that he will join the GT4 South European Series, but he still has some decisions to make. “At this stage it is 100% sure that I will be racing in this series, but I still have to define some aspects. I didn’t decide yet the car and the team with which I’ll be racing, but it will be a competitive package. My teammate isn’t decided too, but I want to team-up with a competitive Silver categorized driver, so we can battle for the title”, he concluded. Diogo Ferrão, CEO Race Ready, GT4 South European Series organisation partner, added: “We want to have good drivers and teams in our series and Miguel fits nicely in that category. Last year he fought for the GT4 European Series’ Pro-Am class title, which proves his quality. He is a really fast Bronze driver and will be certainly one of the top contenders in the GT4 South European Series debut season”. The series promoted by Race Ready will kick off at Nogaro, in the Coupe de Pâques, at April 19th-22nd, and will visit four other circuits – at Circuito del Jarama, Circuit de Barcelona-Catalunya, Autódromo Internacional do Algarve and Circuito do Estoril. In addition, a “Special Cup” will be held at the Vila Real street circuit. The GT4 South European Series’ races will be TV broadcasted in Portugal and Spain and will be broadcasted in its Youtube Channel for the rest of the world.